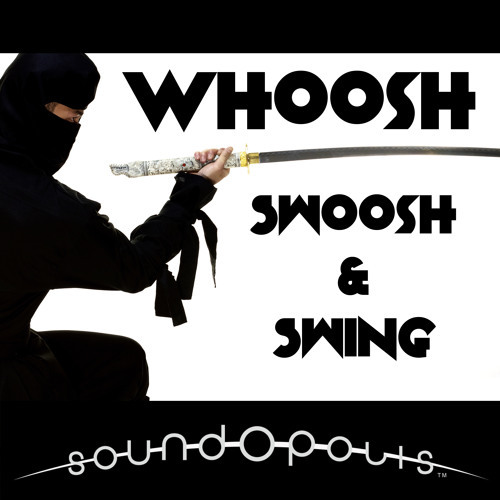 Whoosh, Swoosh & Swing is a large collection of “whipping” sounds made by various objects including golf clubs, swords, spatulas, fishing poles, cloth, and much more. These sounds are essential to a good fight or sports scene, as body parts, weapons, or flying objects whip around the screen! Check out the collection @ www.soundopolis.net Some sounds in this collection were made by blowing across a pop-filter placed in front of a microphone. This allows you to customize your own, much slower whooshing sounds to fit any given situation. Try it yourself! Objects/Methods Used: -	Human Mouth -	Dish Brush -	Electrical Cable (twirling whooshes) -	Cloth flag -	Curtain Rod -	Fencing Sword -	Fishing Pole -	Golf Club Handle -	Tennis Racquet -	Spatulas -	Pasta Spoon -	Golf Clubs -	Underwater -	Rumbles Analog Tape Alterations: Included in this library is a collection of sounds that were sped up and slowed down using analog tape. The process also changes the pitch. The method was simple: playback from Pro Tools to an analog tape machine. Record them to tape. Change tape speed. Record them back into Pro Tools. It was a blast. And the result was a collection of vintage sounding files that are either faster and higher pitched than the original, or slower and lower pitched than the original. Check out the track list for more details. This collection provides some new and interesting sounds, as well as a ton of variations so your soundtrack never gets old! All Soundopolis tracks include metadata tags so they are easy to find using any search engine. All tracks are delivered as 48k and 96k/24bit .wav files. Collections come in easily downloadable zip files.